Are you feeling stressed? Do you feel like there is never enough time in your day? The expression, “don’t work harder, work smarter”, can help alleviate some of your stress. One of the tasks that took up a lot of my prep time each was writing morning messages. I saw the impact of a quality message and its impact on my students’ academic achievement. Unfortunately, I was guilty of not always writing the best quality message when time was limited. One of my favorite ways to begin my day is with morning messages. But, morning messages are TIME CONSUMING to write each day. I have done it a variety of ways through the years. I began my morning message system when I was preparing for my maternity leave. You can read about the system HERE. At that time, I was writing my morning messages on chart tablet paper each day. I didn’t want my long term sub to have to do that each day. I wanted to simplify things for her. When I returned I continued this system because I really liked it. The system is a HUGE TEACHER TIME SAVER! Each class is a little different – with different needs. With this system, there are task cards like the ones in the picture above that you can use to differentiate or extend the morning message. 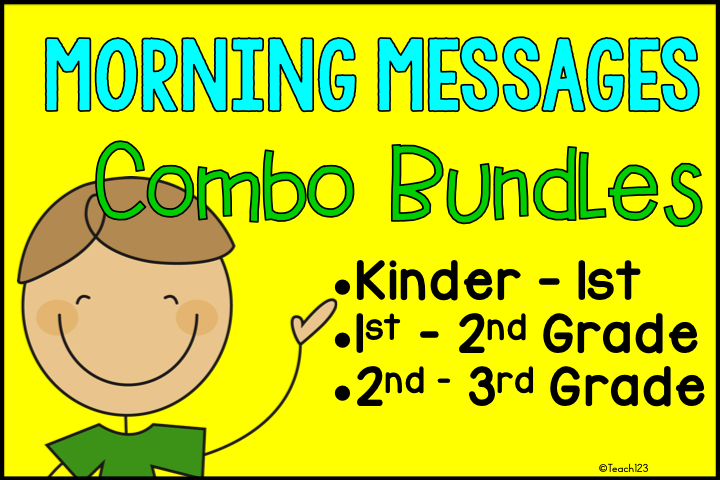 There are a variety of morning message files available for grades Kindergarten – 3rd grade. Some are seasonal and others have a topic or skill theme. There are several files that are free so you can check out the system with your class. Each of the grade level packets include ten morning messages. 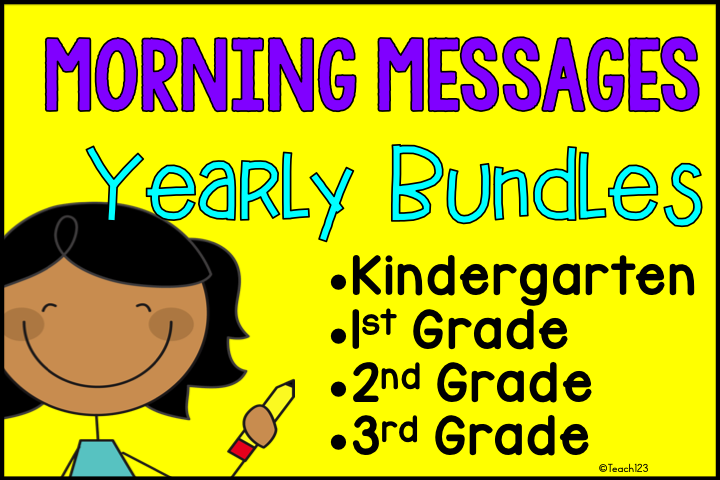 By request, I bundled my September – May grade level packets (links above) into bundles with 90 messages. By request, I bundled two grade levels together. There are 10 messages of each grade level in these packets (20 messages per packet). 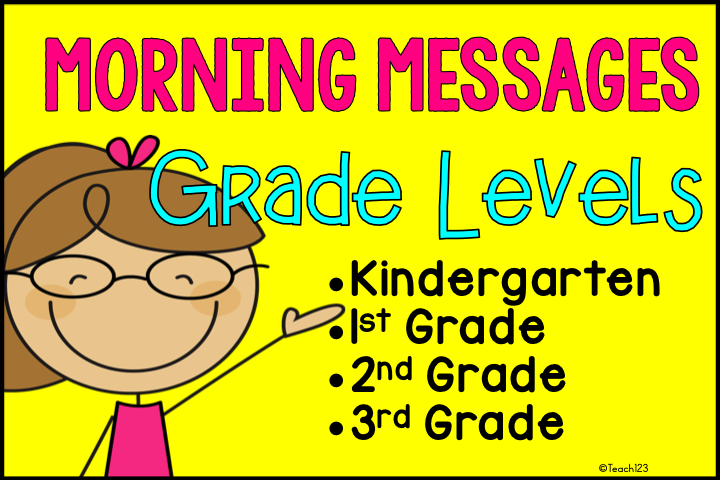 By request, I am adding more grade level packets for teachers who do morning message daily. You can follow my store or Facebook page if you want to be notified when I add more of these packets. 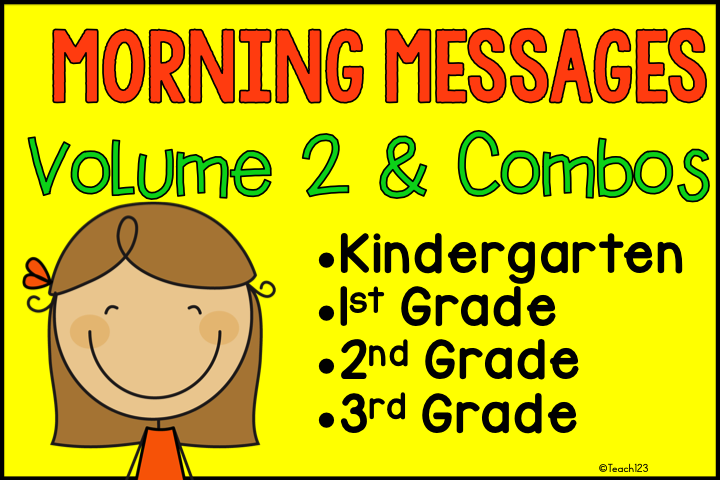 I am selling Volume 2 (10 messages) separately and as a combo with Volume 1 (10 messages) so teachers have the option of having 20 messages. Below are the ones I’ve finished so far. March – K/1 – this file includes more than just sub plans.